This article is in fact in continuation with a previous one, How to Plan your Trip to Gulmarg? 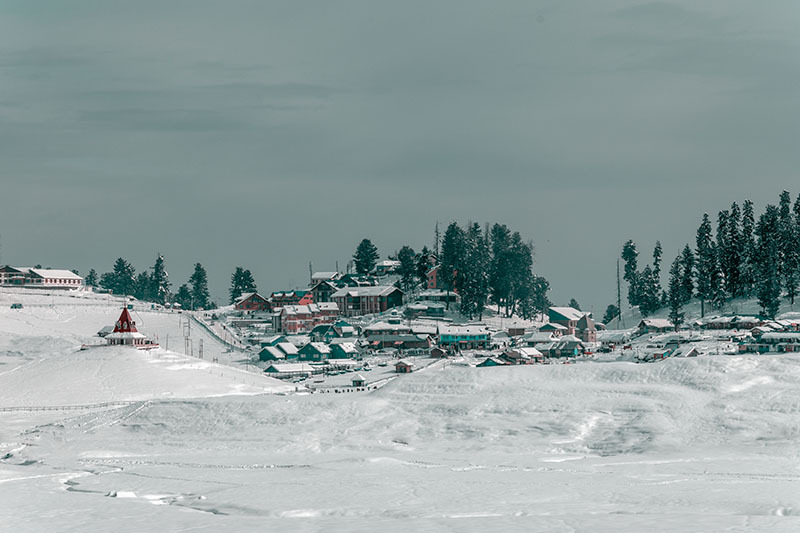 In the previous article, I talked in detail on how you can reach Gulmarg, where to stay, what to see, things to do and how you can travel on a Budget. For all this information, I will recommend that you the previous post. In this particular article, I am only going to talk about things that will remain applicable for Gulmarg in Winter Season; from December till March. Along with the information provided below, I will also recommend that you also read the previous part for more information on visiting Gulmarg. So is a winter trip possible to Gulmarg? It is indeed. Gulmarg remains open for tourism throughout the year; and even during the months of January and February when it can snow as much as 5 to 6 feet here, the road to Gulmarg remains open and tourists continue to visit. This tiny hamlet is one of the few tourist destinations in our country where tourist footfall happens for all 12 months. In the months of winter, it serves as one of the best Ski resorts in our country and you will find plenty of people around. There are however a few things that you must keep in mind which I will talk about in the post below. How to Reach Gulmarg in Winter? There are three parts to get to Gulmarg in winter season. The first part is reaching Srinagar; second one is reaching Tangmarg and third and final one is reaching Gulmarg. You can either be traveling by your own vehicle; rented taxi or public transport. I will talk about all three. If you need a detailed explanation on reaching Srinagar, please read How to Plan a Trip to Srinagar. A trip to anywhere is best done if you are traveling by your own car or motorcycle. It gives you the flexibility to travel in a more relaxed manner and is definitely the most convenient of all. This however will not be the case for a winter trip to Gulmarg. For your first phase, you will reach Srinagar easily traveling via Jammu Srinagar highway. The next phase is of traveling from Srinagar to Tangmarg which too is easy. It is a total of about 38 kilometers, depending on where you start from in Srinagar. For the entire drive, you will feel like you are driving in plains because the climb is not steep at all. There will be some snow but on the sides of the road. It will become tricky however once you reach Tangmarg. The final 15 kilometers between these two places is a very steep and winding road. Tricky part however is that this road gets buried completely under snow. So in order to handle this road, you will need two things. First one is great driving skills and second one being snow chains. Unless you are extremely confident of your own driving skills and know how to handle a vehicle in snow, do not attempt driving here. If you do, then make sure you are bringing in snow chains because without those, you just won’t be able to drive up. Even the local taxi drivers cannot handle this stretch without snow chains. I will not really recommend making a winter trip by motorcycle because the temperature here drops to as far as -15 and -20 degrees Celsius. If you are however confident that you can handle it then travel in the same manner as I explained above. Snow chains will be needed for the motorcycle as well or else you will just be skidding and falling all the way. If you are thinking about reaching by public transport, then I am guessing that you have already made it to Srinagar by either a flight or by Bus. This journey will have to be done in two phases because there is no direct bus from Srinagar to Gulmarg. You will first have to board a bus for Tangmarg which you can either get from Srinagar Bus stand or tourist reception center. Once you reach Tangmarg, just go the Bus stand there and board a bus for Gulmarg. These are not the regular JKSRTC buses but rather the mini buses. There is no set timing to these. These buses travel all day long and just as soon as they are full and the drive is ready to go. Even the buses drive up with snow chains on. The ticket is Rs. 30 per person. Tricky part however is getting rid of the guides. They will try to fool you and ask you to take a private cab from Gulmarg. Do not fall for anything they say. Just give them a deaf ear, keep walking and get to the bus stand which is on the right hand side just before Tangmarg. Reach there and hop on a bus to save yourself some money. A shared taxi too runs pretty much on the same lines as a Bus. You will first have to get to Tangmarg for which, your best bet of finding a shared taxi is either from the Tourist taxi stand near Nehru park; or the main Srinagar Bus stand. After you reach Tangmarg, just get to the Bus stand and look for a “service gaadi”. Do not use the word “shared cab” because you will then just get a shrug and standard “I don’t know’ as reply. Once again, people will try to talk you into hiring a private cab but just ignore and get to the Bus stand. From there, look for a “service gaadi” for Gulmarg which is mostly a Sumo and will cost you Rs. 50 per person. In winters, a private taxi from Srinagar is not allowed to go to Gulmarg. This cab will bring you only as far as Tangmarg. From there, you will then have to rent another cab which will cost you Rs. 1000 for a drop to Gulmarg. That is correct; just for a drive of 15 kilometers, you will have to pay Rs. 1,000 at Tangmarg. If you rent a private cab for both dropping at Gulmarg and then bringing you back, it will cost you Rs. 1,600. These cabs are available at the Taxi stand which is extremely hard to miss once you reach Tangmarg. So for a private cab, you will first pay at least Rs. 1500 to Rs. 2000 for your journey from Srinagar to Tangmarg; and then Rs. 1000 for Tangmarg to Gulmarg. In short, about Rs. 2500 to Rs. 3000 for a short drive of 50 odd kilometers. And then you will spend the same amount of money for your journey back to Srinagar. If you are renting a private cab, my advice would be to contact a hotel in Gulmarg, book your stay with them; and ask them to send a taxi for you to the airport. This cab will charge you Rs. 2000 from airport to Gulmarg. So you will save about Rs. 1000 there and also the hassle of changing cabs at Tangmarg. Hotel Affarwat in Gulmarg provides this service. The contact person there is Sajjad and his number is 9419741696. Give my referral and you can get a discounted rate at the hotel. I have posted more information about this hotel at Hotel Affarwat Review – A Great Place to Stay in Srinagar. Come December and it can snow in Gulmarg at anytime. However, both the intensity and frequency of snowfall in December is very low. Heavy snow starts to occur in early January and then lasts will mid February. During this time, it mostly snows about 4 days a week. By the end of February, there is several feet of snow on the ground. Frequency and Intensity of snowfall again reduces by March and the snow starts to melt by March end. During this period, snow storms are a common occurrence and sometimes even the roads can get blocked if it snowed too much. Temperature in Gulmarg during winter fluctuates between 0 to -15 Degrees Celsius. Nights can be freezing cold and you will barely be able to step out of your hotel early in the morning and late in the evening. An even more important question however is of what to pack. As you can probably already guess, you will have to bring in all your woolens. Get some good quality thermals as well. A heavy windproof and waterproof jacket is must. Make sure that your jacket also has a hood to it to protect your head, face and neck. If it doesn’t, then you will have to get a woolen cap as well; preferably a Balaclava. You will also have to pack good quality gloves to keep your hands from freezing. Try finding a waterproof one if possible. The biggest doubt however comes about what shoes to pack. Your normal sports shoes won’t do because you will be walking around in snow and just can’t afford to get your shoes wet, or for the snow to enter your shoes. Cousin of mine was walking around in Puma sports shoes and with all the snow, soles of both the shoes came off. What you need is Boots that go well above your ankles. If you can find ones that are snow and waterproof, then it would be cherry on the top. You can knot your boots tightly, then pull your jeans on top of it to make sure that snow won’t enter inside. If you don’t have boots that can survive the trip and you also don’t want to buy just for the trip, then worry not. Snow boots are available for rent in Gulmarg itself. You can reach Gulmarg and get these here for Rs. 250 per day per pair. They will quote you Rs. 500 per day but you can easily negotiate down to Rs. 200. Once you arrive in Tangmarg, they will try to fool you into believing that there are not boots available for rent in Gulmarg which is not true. Ignore these so called guides and rent in Gulmarg itself. The only time you would want to rent these boots in Tangmarg is if you were making only a day trip to Gulmarg and intended to return a few hours later. In that case, you can rent the boots as well from Tangmarg when you hire the private taxi. I myself went there in Provogue Boots and they survived the trip fine. My cousin was wearing sports shoes and they just kept getting wet in the snow before the soles came off entirely. Gulmarg remains to be a major tourist attraction in winter season as well for which, all hotels here remain open and functional. One thing that you should however remember is that there is no budget hotel as such in Gulmarg. The price goes even higher up during winter season. Expect the average minimum price to be around Rs. 2000 to Rs. 2500 per day. If you do not want to spend that kind of money, then a better way would be to stay in Srinagar city; and make the visit to Gulmarg a day affair. Start early in the morning from Srinagar, arrive at Gulmarg by 10 AM; spend a couple of hours and be on your way back after having lunch here. All hotels here are very well equipped to handle the freezing temperatures outside. There will be three types of heaters in the room. First one is a big permanent heater installed in a corner of the room. Second is a heater in your bed. You read it right, it is installed inside the bed and will warm up the mattress. The third one is a blower kind of thing that throws out warm air after getting plugged in. With so many heaters, your stay will be very warm. To be honest, once inside the room, you will just be wearing a light sweater no matter how cold it gets outside. In terms of food, you can either order from hotel only which would be convenient. Or you can step out and eat any of the local restaurants in the small market area. Snow covered meadows and a live snowfall is the first thing that you would want to see in Gulmarg in winter season. The natural beauty of the snow with several feet of snow all around is something that you will cherish for days. Apart from the snow, all tourist areas in Gulmarg remains accessible in winter season. Places like St. Mary’s Church, Maharani Temple, Golf Course will be open for tourists. Gondola ride and trek to Alpather Lake however entirely depends on the weather. Gondola ride may get cancelled on some days when the weather was not favorable. Trekking to Alpather lake entirely depends on whether or not Gondola to Phase 2 is available; and how much snow is there on the ground. To be on a safer side though, if you want to visit Alpather Lake, then better take a guide from Gulmarg and do not attempt it on your own. Tourist attractions in Gulmarg are as mentioned below. This is just a list of all the places. If you want to know more about these spots and their locations, please read A complete list of Tourist Attractions in Gulmarg. Apart from enjoying the natural beauty of the place and spending some time in peace; you can indulge yourself in some winter sports, of which Skiing is the major one. Just take a walk around and you will have plenty of guides asking you try your handle at Ski. Their rates are however quite high. For half an hour Skiing, you will be paying Rs. 1100. For one hour, you will be asked to pay Rs. 2000. A ride on snow scooters and wooden sledge are two other popular activities in winter. The last time I was in Gulmarg in winter, I also saw a Zorbing Ball there so you can try your hand at that as well. Gondola ride (which is the biggest attraction of Gulmarg) and trekking are two other things to do in Gulmarg. A trek to Alpather lake from Gondola Phase 2 station is the shortest one. If you are in for more adventure and are physical fit, then you can trek to the lake all the way from Gulmarg itself. There are in fact several other trek routes from Gulmarg if you had the time. For more details on Gulmarg Gondola and Alpather Lake, please read How to Plan a Gulmarg Gondola ride and How to Trek to Alpather Lake. If you went visiting Gulmarg in November, then you are going to be there in off-season and at a very dull time. There is definitely not going to be any snow around and even if it was there, it will be very little. It is very rare for a heavy snowfall to occur in November. But it does happen sometimes, like in 2018, and chances are only towards the end of November. Otherwise, it will be a bit dull in terms of scenery. There is not going to be any greenery around, grass will all be dried up and there won’t be any snow either. On a positive side, in the month of November, you won’t have to change your mode of commute at Tangmarg. You can rent a taxi in Srinagar and it will bring you all the way to Gulmarg. Weather will be cold but not way too much. During the start of the month, day temperature will be around 20 Degrees Celsius and nights will be at around 3 Degrees. By end of the month however, day temperature will dip down to around 10 Degrees and nights will be freezing at -2 Degrees Celsius. In terms of reaching Gulmarg in December, you will have to follow the same process that I explained above. In the beginning of the month, when there isn’t much snow on the road, you may be able to book a ride straight from Srinagar to Gulmarg. But towards the end of December, you will definitely have to change mode of commute at December. You will first have to book a taxi from Srinagar to Tangmarg; and then either book another cab at Tangmarg or board a bus or shared cab for Gulmarg. Snowfall usually occurs towards the end of the month. It may happen in early or Mid December as well but won’t be heavy and intensity is not really that high. Even if it does snow, snow will just melt away and will not stick to the ground. Day temperature will fluctuate between 0 to 10 Degrees Celsius while nights will range between 0 to -5. For reaching Gulmarg in January, you will definitely have to change mode of commute at Tangmarg. Your taxi from Srinagar will not be allowed to go all the way till Gulmarg. It will start to snow towards end of December and will continue throughout the month of January. On an average, it will snow about 3 to 4 days a week at least and the intensity could differ from light to heavy. Snow will start to stick to the ground and by mid January, there will already be at least 2 to 3 feet of snow accumulated. Depending on the weather and intensity of the snowfall, it can be even as much as 4 to 5 feet of snow at some places. Temperature will either remain close to zero or several degrees below at. Nights can sometimes go as low as -10 to -15 degrees Celsius. This is the time when all the winter sports in Gulmarg are at full swing because of the high amount of snow on the ground. It makes up for a perfect setting for skiing and several other snow related activities. Snowfall will be more frequent and intense towards the beginning of the month but will continue to get lesser as the month progresses. You will be needed to either rent a private taxi or board a bus or shared cab from Tangmarg in order to reach Gulmarg. In terms of tourism, February is a better month than January because of slightly better weather conditions. Average day temperature will range between 5 to 10 Degrees Celsius and average night temperature will remain close to 0. March is another great month for a winter trip to Gulmarg, specially towards the beginning of the month. Weather conditions would have improved tremendously with average day temperature ranging between 10 to 15 Degrees and night temperature between 0 to 5 degrees Celsius. It does snow in Gulmarg in winter as well but the frequency will continue to decrease with each passing day. Nonetheless, you will still be able to find plenty of snow in a pleasant weather setting making it a perfect time to be in Gulmarg. You will not be able to go straight from Srinagar to Gulmarg though and will have to either rent a taxi or board a bus from Tangmarg. And I think that is pretty much it. Mentioned above are some of the details that will only be applicable in winter season. For a complete travel guide to Gulmarg covering everything that you need to know, please read How to Plan a Trip to Gulmarg. I hope the details above were of help. If you have any other questions; or need any further details, please feel free to ask in the comments section below; or at our Community Forum; and I will be glad to answer.